Deciduous geophyte 80-230 mm tall when in flower, tuber turnip-shaped or elongated, sometimes moniliform. Lamina trullate in outline, pinnate to bipinnatisect with 3-5 pinnae, 70-130 x 70-140 mm, pinnae 40-90 mm long, lobed to laciniate, adaxially and abaxially hirsute with appressed hairs interspersed with very short glandular hairs. Petiole 60-80 mm, erecto-patent, densely hirsute with short appressed hairs, stipules subulate, adnate to petioles for half their length. Scape 30-150 mm long, bearing 2-6 pseudo-umbellets, each (8-)14-23 flowered. Pedicel cca. 0.5 mm. 5, lanceolate, apices acute, 4-6 x 1-2 mm, patent during anthesis, pale green with membraneous margins. 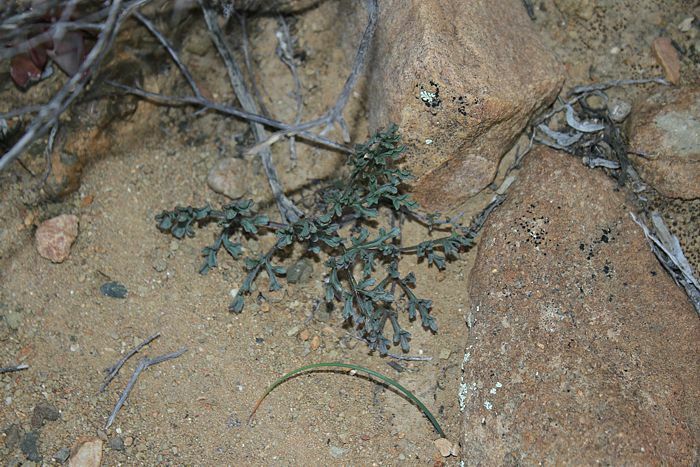 Hypanthium 24-35 mm, pale green. 5, pale yellow, patent during anthesis, posterior two with pale V-shaped markings, ligulate to spathulate, bases cuneate, apices rounded or emarginate, recurved, 8-10 x 2-3 mm, anterior three with a single dark pink stripe on each, spathulate, bases attenuate, apices rounded, recurved, 9.5-13 x 2-3 mm. 2 fertile, in lateral position, 4-6 mm long, protruding from flower, free filaments white, twisted so that pollen surfaces of the anthers are turned to the front, pollen yellow. Posterior staminodes 1.5-2 mm long, anterior five staminodes 4-6 mm long, protruding from the flower. 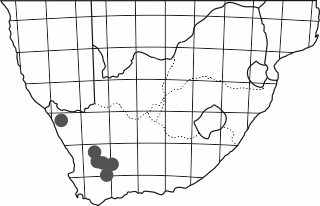 P. fumariifolium has a wide distribution but does not occur in large populations. 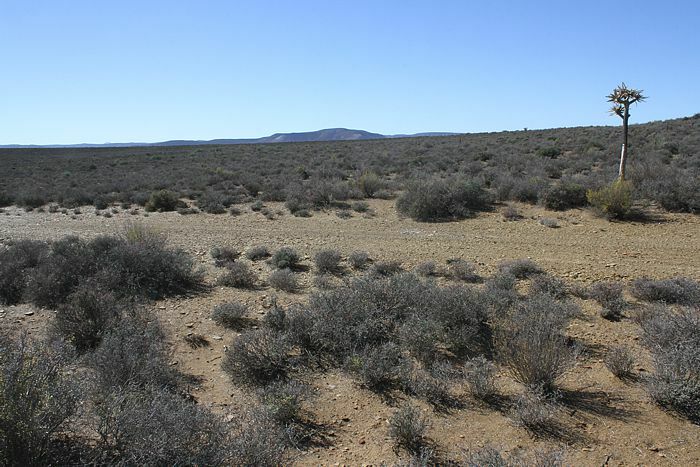 Above, a photograph of the flat karooid veld between Nieuwoudtville and Loeriesfontein in 2017, where after three years of drought the landscape looked really sad, although P. fumariifolum plants looked happy and green. The androecium of this species is unique, with the five anterior free anthers forming a truly unusual moustache. The two fertile stamens are twisted such that the anthers are turned to the front, a character shared with only a few other Hoarea species, such as P. luteum and P. sp. nov. MST903. 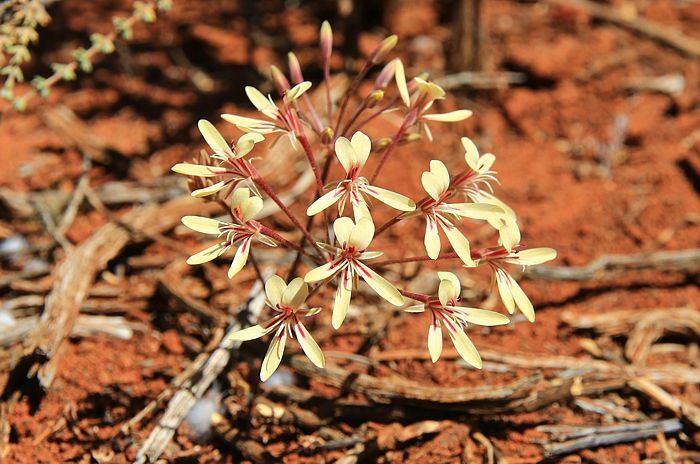 Few pelargoniums share this sun-drenched spot, an Otidia species (possibly P. carnosum ssp. 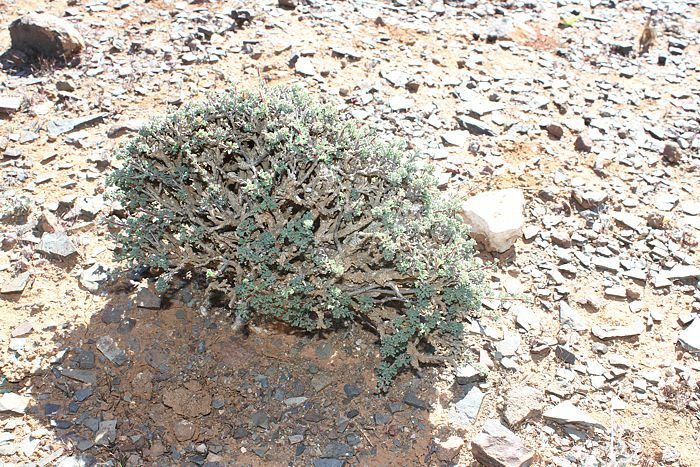 ferulaceum or P. parviflorum), and the above shrubs with all the characteristics of P. karooicum, except that this species rarely forms solitary shrubs - the above would be truly exceptional if indeed this species.